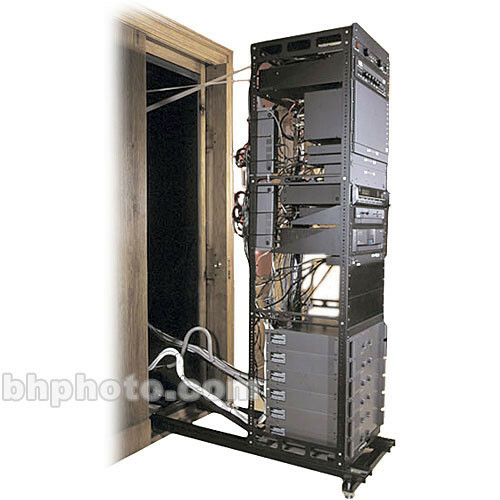 Middle Atlantic's In-Wall 43U AXS System with 25" Extension and 16" Depth is the ultimate full-service electronic device manager rack, because it allows convenient pull-out access to your equipment. This SSAX model features 43U (75.25-inches high) of rack space and extends 25 inches for rack wall. The SSAX series touts 16 to 10-AWG gauge steel that supports up to 650 lbs--much higher than average rack systems. It is constructed with a detachable rack frame for off-site equipment integration, yet has all of the in-house characteristics that make it invaluable: smooth glide ball bearings, articulating cable carriers, pre-marked standard rack holes, and the option of 3"H to 40"H rack installation (requires removable stand for elevated setup). For all-tech perfection, install this rack system into any modular wall and tuck it out of sight. Black anodized finish and black e-coat remain wear resistant as the SSAX system does its job. It features top rack space that can hold up to two fans. This prime rack system gives electronic systems the pivotal treatment for which they were designed. Middle-Atlantic holds nothing back in convenience, utility, and ingenuity of design. The best device protection and display is right here. You don't have hold your breath as the last peripheral is placed on deck, because this SSAX series has a whopping 650-lb capacity on every one of its rack systems. This series is uniquely design to have a 25" rack extension for larger devices and for even easier installtion. Don't worry about the cables! The articulating extenders on this model expand and retract with the rack so that your system remains wire-jam free and worry free. This model allows you free interpretation of your rack. Adjust rack shelves (not included) to fit any devices you need to place on this rack. With clearly marked mounting holes and plenty or arrangement varieties, this rack system is an easy-going design that fits your work space. When devices are stacked on top of one another, device heat management suffers. This shelving unit features an open design for thermal management, and top rack space for two fans. Middle-Atlantic uses 16- to 10-AWG gauge steel on this rack. Feel comfortable that your shelving unit can easily support your devices up to 650 lbs.